Pneumatic transmission is transfer power by gas pressure or information fluid by compressed gas as the working medium. The system of transfer power is to transfer the compressed gas through the pipe and control valve to the pneumatic actuator, which can transform the pressure of the compressed gas into the work of mechanical energy. 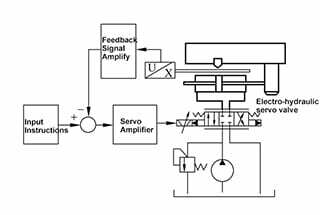 The system of transmitting information is to use the pneumatic logic element or the jet element to realize the function of logic operation, also called pneumatic control system. Low working pressure, the average of 0.3 ~ 0800000 mpa, gas viscosity is small, a small loss in pipelines is advantageous for the gas supply and middle distance transportation, the use is safe, no explosion and shock hazard, with overload protection ability; but the air pressure is low and needs an air supply. Pneumatic transmission consists of air source, pneumatic actuator, pneumatic control valve and pneumatic auxiliary. Air sources are generally supplied by compressors. The pneumatic actuator converts the pressure of the compressed gas into mechanical energy used to drive the working parts, including the cylinder and the pneumatic motor. The pneumatic control valve is used to adjust the direction, pressure and flow of the air, which is correspondingly divided into directional control valve, pressure control valve and flow control valve. Pneumatic accessories include: air purifier, Air lubricator, noise mufflers, pipe joints, etc. There are also aerodynamic sensors that are used to sensor and transmit information in a pneumatic transmission. 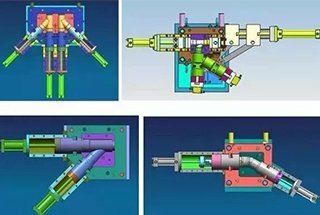 the structure of pneumatic components is simple, easy to process, long service life, easy to maintain, the pipeline is not easy to clog, and the medium does not have the problem of metamorphic replacement. air compressibility is large, so the dynamic stability of the pneumatic system is poor, and the impact of load change on working speed is great. 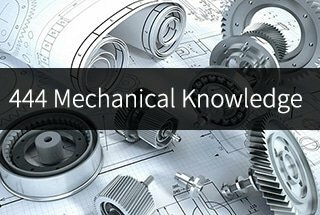 Hydraulic transmission is the transmission of energy and control by using the liquid as the working medium. 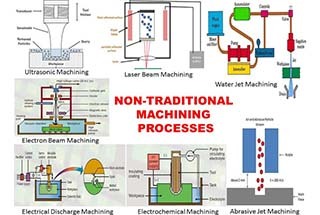 Use hydraulic pump to convert mechanical energy into liquid pressure energy, through the change of liquid pressure to transfer energy, through a variety of control valves and piping transmission, by means of hydraulic actuators (hydraulic cylinder or motor), the liquid pressure can be converted into mechanical energy, and thus drive work mechanism, realize the straight line reciprocating motion and rotary motion. The liquid is called a working medium and is generally used for mineral oil. Its function is similar to that of transmission elements such as belt, chain and gear in the mechanical transmission. Power components, namely hydraulic pump, its function converts the mechanical energy into the fluid kinetic energy (for the performance of pressure and flow rate), its role is to provide pressure oil to the hydraulic system, is the power source of the system. Auxiliary components, including fuel tanks, oil filters, pipes and joints, coolers, pressure gauges, etc. Working medium, i.e. transmission fluid usually referred to hydraulic oil. The hydraulic system is carried out through the working medium, and the hydraulic oil can lubricate the moving parts of the hydraulic components. Here is an example of a simple grinder. 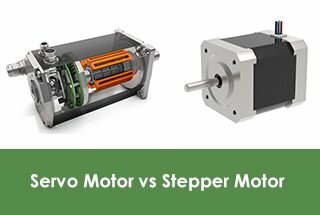 The motor drives the hydraulic pump to absorb oil from the tank, and the hydraulic pump transforms the mechanical energy of the motor into the liquid pressure energy. The hydraulic medium enters the left cavity of the hydraulic cylinder through the throttle valve and the reversing valve, pushing the piston to move the right side of the table, and the hydraulic medium discharged from the right cavity of the hydraulic cylinder flows back to the tank. After the reversing valve, the hydraulic medium enters the right cavity of the hydraulic cylinder, causing the piston to move to the left and pushing the table backward. Changing the opening of the throttle can adjust the movement speed of the hydraulic cylinder. The pressure of the hydraulic system can be adjusted through the overflow valve. 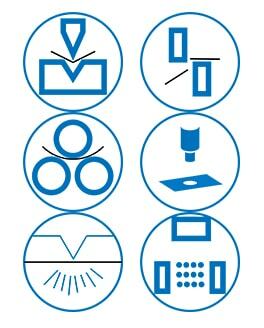 When drawing a hydraulic system diagram, the symbol is used to represent hydraulic components for the sake of simplification. This symbol is called functional symbol. 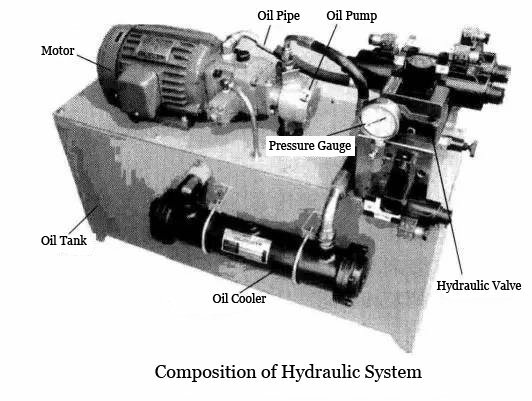 A typical oil line that is composed of hydraulic components to complete specific functions. 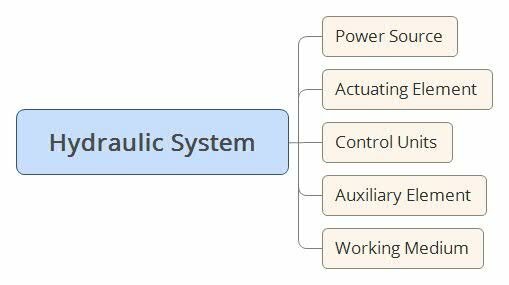 Any hydraulic transmission system is composed of several basic circuits, each of which has certain control functions. Several basic circuits can be combined together to control the movement direction, work pressure and movement speed of the actuator. According to the control function, the basic circuit is divided into the pressure control loop, speed control loop and direction control loop. 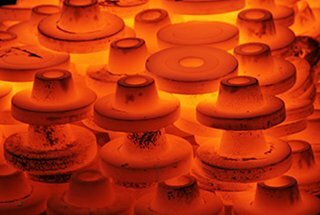 The pressure control valve is used to control the circuit of the whole system or local range pressure. 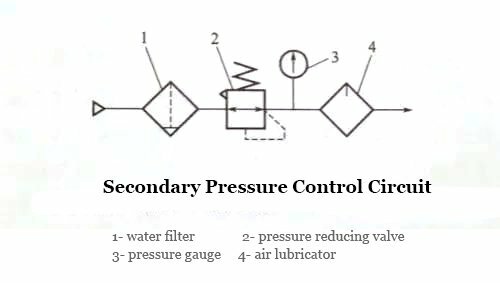 According to different functions, the pressure control circuit can be divided into four circuits of pressure, which including pressure adjustment, pressure change, pressure release and pressure stabilization. Control the flow rate of the actuator by controlling the flow of the medium. 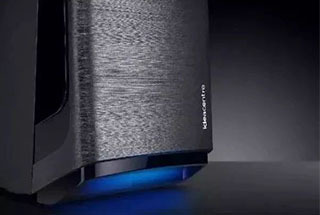 The function is divided into the speed regulating circuit and the synchronous loop. Control the flow direction of the hydraulic medium. The directional control valve controls the movement direction of a single actuator, allowing it to move or stop in a positive and negative direction, known as a commutator circuit. 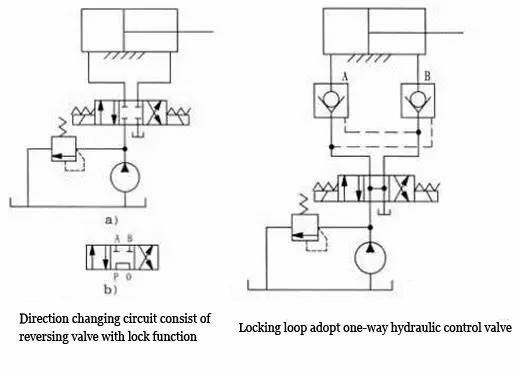 When the actuating element stops, the circuit that prevents the leakage from the external due to the loading and other external causes of the leakage is called a locking loop. Transmit energy by liquid kinetic energy with liquid as a working medium. 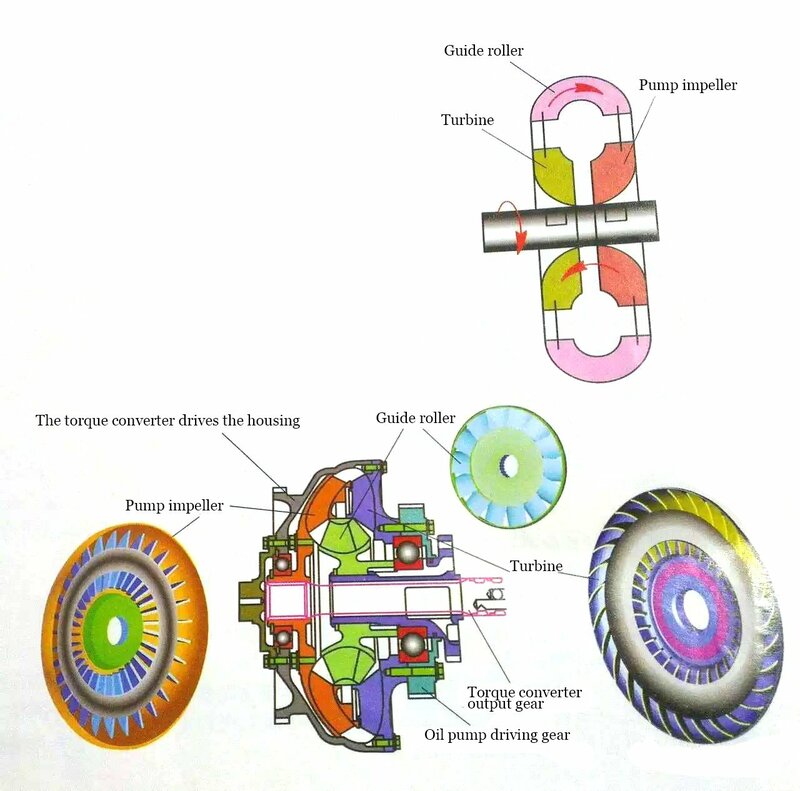 The impeller converts the rotational speed and torque input to the engine (internal combustion engine, motor, turbine, etc.) and drives the working part of the machine through the output shaft. 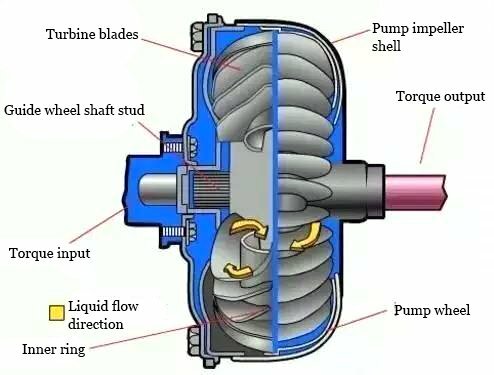 The fluid and the impeller in the input shaft, output shaft, and shell interact with each other to produce the change of the moment of momentum to achieve the purpose of transmitting energy. 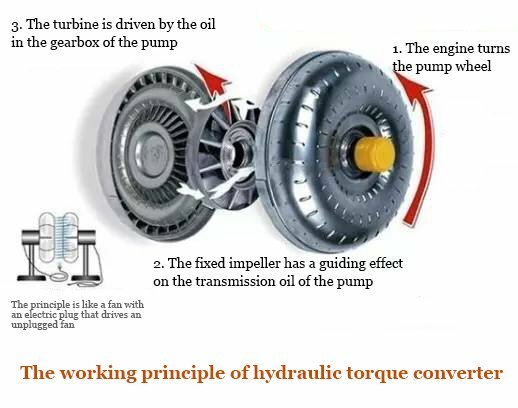 Hydraulic transmission is very different in principle, structure and performance from hydraulic transmission to fluid pressure. 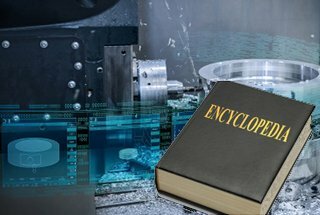 The input shaft and the output shaft of the hydraulic drive are only connected to the working medium by liquid, and the non-direct contact between the components is a non-rigid transmission. vibration isolation and vibration isolation. 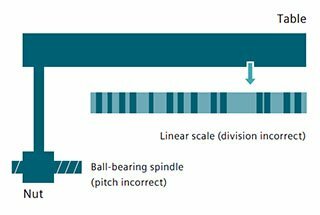 When the pump rotation speed is constant, and the load changes, the input shaft (i.e., the pump wheel or engine shaft) will change. 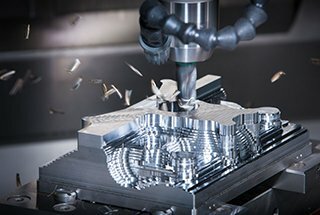 Because of different types of hydraulic elements, different penetrability can be used to match the engine according to the different requirements of work machines, so as to improve mechanical power and economic performance. The original motive (internal combustion engine, motor, etc.) drives the pump wheel to rotate, which increases the speed and pressure of the working fluid, which realizes the transformation of mechanical energy into liquid kinetic energy. 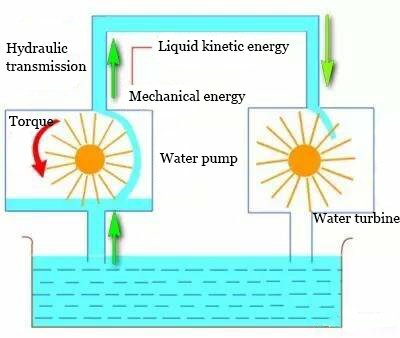 Then the working liquid with kinetic energy will then hit the turbine, and the liquid releases energy to the turbine, so that the turbine will turn to power the output and realize the energy transfer. It is used to realize energy transfer by the liquid kinetic energy of the liquid, and it is common to have a hydraulic coupler, hydraulic torque converter and hydraulic mechanical component. 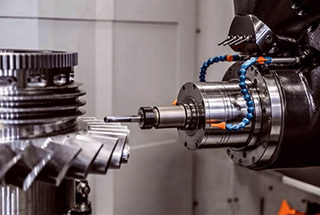 Also known as the hydraulic coupling is a mechanical device used to connect a power source (usually an engine or motor) with a working machine to deliver rotational power. Automatic transmissions used in automobiles are also widely used in Marine and heavy industry. A hydraulic element consisting of a pump wheel, a turbine, and a guide wheel. It is installed between the engine and transmission, with the hydraulic oil as the working medium, play the function in torque transmission, torque change, speed change and disconnection. 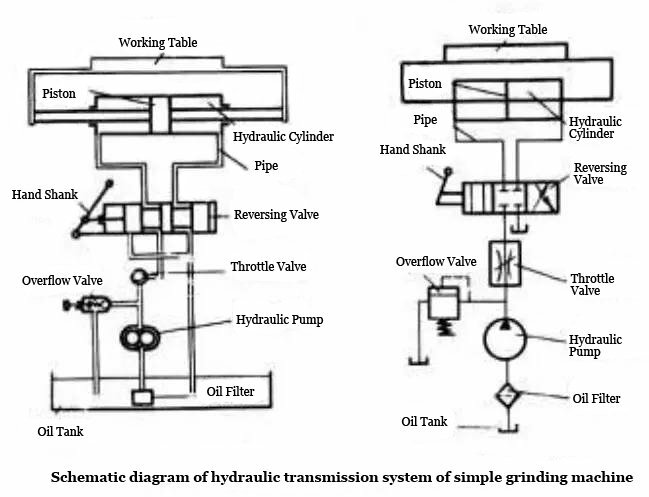 Hydraulic transmission used in modern machinery began in the early 20th century, as the earliest ship power equipment and the transmission mechanism between the propeller, to solve the problem of high power, high-speed steam turbine as well as gas turbine and speed is limited by “cavitation”. Now hydraulic transmission has been widely used in automobiles, tractors, construction machinery, construction machinery, railway locomotives, tank armored vehicles, oil drilling machinery, lifting transportation machinery, fans, pumps etc.